-Marcus vs. Hyoga, Hyoga kills Marcus in an instant! Powerful!! -Nimrod vs. Shiryu, Shiryu can't defeat Nimrod, right then Shura!! 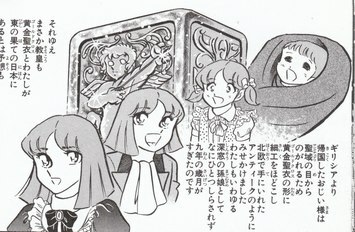 -Hecate vs. Kanon, the 4 Bronze Saints can't defeat Hecate, finally Kanon appears!! -Haman vs. Seiya, Seiya has a hard fight with Haman but wins with authority!! -Antoin vs. Hyoga, Antoin shows the true power of ice but Hyoga starts to awaken the Mystic Zero!! -Midas vs. Shun, Midas defeats Shiryu but Shuns show the real power of his chains!! Incredible!! -Idun vs. Ikki, Idun and Ikki, Double K.O.!! Right then Ikki remembers his Mother!! -Cleo vs. Shaka, The fight between Angel Cleo against the Fallen Angel Shaka!! Shaka shows his resolve!! -Seiya, Shiryu, Hyoga, Shun and Ikki vs Oracles, all the Oracles are defeated!! -Hera vs. Athena, Athena shows her real power! The Gods' Heated Battle Begins!! 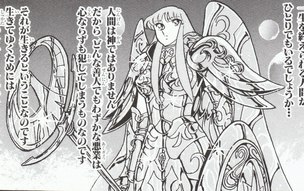 Hera's Kamui returns to the Paradise in which she governs. -Hercules vs. Poseidon(Julian), Hades(Shun), The 3 Olympus Gods confront each other and a big bang occurs!! -Apollon vs. Seiya, Apollon shows his real power! Seiya is dead!! -Hermes vs. Hyoga, Hermes shows Hyoga the ulimate truth! His Mama really is!? -Prometheus vs. Ikki, Prometheus shows a power beyond an Olympus God! Ikki needs a reborn!! -Artemis vs. Shun, Artemis shows her awesome power! Right then, Shun's chains shows DXV!!! -Hephaistos vs. Shiryu, Shiryu has no chance to win but right then the Gift of Athena reveals!! Where is Seiya? Where is Marin? "This is weird..." says Seiya who has been running around, "I can't reach Mt. Olympus. If I don't get to Athena... UOH!!" Seiya has finally reached a Temple and he sees someone standing in front of it! "Ah!! ", shouts Seiya who can't believe it! It is!! "Seiya. ", answers the Eagle Saint. "MARIN!! ", shouts the glad Seiya, "You... You're alive! It's great. I was so worried after your little brother, Kyou, told me you were missing. But... But why are you here? Are you here to support us?" "Yes... I'm here to finish my mission..."
"Before that I think it's time I show you my face..."
Slowly, Marin takes off her mask and finally Seiya can see her face. BUT! SEIYA CAN'T BELIEVE WHAT HE'S SEEING!! THE FACE OF MARIN LOOKS JUST LIKE!! "SEIKA!! ", shouts Seiya, "YOU ARE SISTER SEIKA!!" "Sister Seika!! ", shouts Miho at Star Child Orphanage. "Yes...", answers Seiya’s Big Sister tending to the children there. "There's someone here to see you..."
Miho brings a man behind her. Seika walks to meet him. The man is almost thirty years old but some how when she looks into his eyes, he senses a sacredness about him. "My name is Phrixus. ", says the man, "You don't remember me, do you...?" "Phrixus...? ", says Seika to herself, drawing a blank. "Ha! ", laughs Phrixus, "It is not unreasonable you can't remember. It was I who erased it..."
"COME!! ", shouts Phrixus, directing a pulse with his right index finger toward Seika, "IT IS FINALLY TIME FOR YOU TO REMEMBER EVERYTHING!!" "AHHHHHHHHHHHHHHHH!!!!!!!!!!!!!!!!!! ", screams Seika filled with immense pain!! "WHAT ARE YOU DOING!? ", shouts Miho, "STOP THIS NOW!!" But suddenly, Seika grabs hold of Miho. "It's okay, Miho. I'm fine. ", says the now calm Seika. She looks toward Phrixus, "I do remember you, Phrixus! IT WAS YOU WHO SEPARATED MY BIG SISTER FROM ME!!" "No. 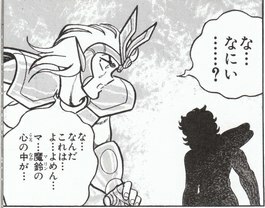 Seiya...", says the Silver Saint, "I am not Seika. But I am her Big Sister." "Big Sister? Then you're saying you, My sister Seika and you are twins!? But Marin!!" "Seiya, Marin is my fake name." "My real name is Rinran." "But! Ma... Rinran!! I never heard from my Sister Seika that, she had a twin..."
"Ha! ", laughs Rinran, "That's because someone erased her memory of my existence..."
"But, why would someone do that...?" "Like I told you before I'm here to finish my mission... 13 years ago was where everything started..."
"THEN!! THEN!! YOU MEAN!! SAORI!!" "YES!! MY REAL MISSION IS TO HELP ATHENA!!" "You have a twin sister? ", shouts Miho full of shock. "Yes...", says Seika, "It was this Phrixus here who made sure I didn't tell anyone about her existence... But Phrixus, I still don't understand, why did my sister's existence had to be a secret!?" "13 years ago, Saga tried to kill the baby Athena...", answers Phrixus, "Aiolos saved her and entrusted her to Mitsumasa Kido... But before that, Saga killed Pope Sion..."
Founder of the Graude Foundation. I went there in secret to help him protect her! "IT WAS I WHO TOLD MU AND DOHKO THAT SAGA KILLED POPE SION!!" "IT WAS I WHO RESHAPED THE SAGITTARIUS GOLD CLOTH TO LOOK LIKE AN ANTIQUE!! "AND IT WAS I WHO ORDERED THE 100 ORPHANS TO BE GATHERED AND SENT TO BE TRAINED!!" Phrixus pauses to let all this sink in. Finally Seika breaks the silence, "Then my Sister was also sent to be a Saint...?" "Athena needs help...", says Rinran, "She can't win over Zeus without the Treasure of Universe." "The Treasure of the Universe? ", wonders Seiya. Right then, Rinran brings up her right hand. She is holding a box. Seiya takes the box and opens it and he sees!! "This... This ... CAN IT BE!?" "Yes! ", says Rinran, "Athena's Third and Final Item!! had a third item, Athena's Orb! "From the time of the myths, this Orb has been lost in the passage of time, but it was said that one day, someone would find it and bring it back to Athena..."
"Then you're saying, you are that person!?" "Yes. I was chosen because I was gifted. Since I was very young, I had a strong Six Sense. So Phrixus, the Aid of Pope Sion, taught me the ultimate secret of the Psychic Soldiers, Sunyata Method!!" protected anyone man or god from reading my mind, to prevent anyone who would try to retrieve information from my heart or to know my identity..." Rinran pauses to let everything he told Seiya to sink in. Finally, Seiya breaks the silence, "And Kyou is actually..."
Episode 26: Zeus! Appears Since Mythology!! friend lived. So, I was given a fake name and I went to live with that family. Few years after Kyou was born, he disappeared into Sanctuary, Greece. I went there to try to find him..."
"And so, you also became a Saint like he did..."
"But, there's still one thing I don't understand. How did you come to Olympus? There's no way you can enter here alive or Heaven for that matter..."
"Come, Seiya...", says Rinran as she brings him inside the Temple. As Seiya walks toward the center of the Temple, he sees an object. IT IS A KAMUI!! The Kamui is a woman holding a shield in the left hand and an apple the right hand. "This is the Kamui of the Goddess of Love...", answers Rinran. "YES!! YOU ARE STANDING IN VENUS TEMPLE, AT THE PARADISE OF LOVE!!" "Then, it was the Love Goddess, Venus who brought you here..."
Seiya looks around and he doesn't see anyone else in the Temple, "Where's the Goddess?" "I do not know. She has been missing since before Zeus entrusted the Land to Athena. It was her Cosmo that protected me... But, Seiya! What's important now is that you deliver this Athena's Orb to Athena. Without it, there's no way she can win over Zeus!!" Rinran gives the Orb to Seiya, "It's up to you! Seiya!!" Seiya holds it tight in his right hand and smiles, "I understand." Rinran finally smiles too. 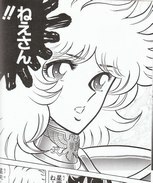 Seiya starts to walk out of the Temple but stops for a second to look back to say, "As I always thought, Marin... You are beautiful..."
Conference Room and Audience Chamber. She enters the building at the end, called Judgment Room. Inside that building, she sees a white throne! A man is sitting on that white throne. He is sitting regal like a king, holding a Scepter in his right hand. Athena kneels down in front of him and bows her head. Finally, the man speaks, "So, you finally returned to Olympus, Athena..."
"My Sovereign...", utters Athena respectfully, "I beg You that You would listen to what I have to say..."
"I beg You to stop the Supreme Comet!" "I have made my judgment, Athena. Even you can not stop it." "I don't understand. What will be accomplished by destroying the Earth?" "The Earth needs a Renewal. Only when a New Age of the Gods begins will it be worthy to exist. Athena, it should be I who's asking you! Join me now to watch this Grand Event!!" "It was I who gave you the control of the Earth, so, of course, I can take it back. Every human, every creature, every plant on the Earth is alive, because we Gods gave them life, we have every right to take it back when ever we choose..."
"WHAT!? ", shouts Athena who can't believe Zeus would say these words. "Athena, I have not abandoned you. I'm will entrust the Earth to you again, just not one that's polluted... Will you accept this offer?" "THEN DIE!! ", shouts Zeus as a flash of light shines, but suddenly!! "SEIYA!! ", shouts Athena, as she sees the Pegasus Saint enter the Room. "I won't let you hurt Athena! I don't care if you're Zeus!! PEG...!!" But Athena interrupts Seiya, "NO!! SEIYA!!" "Saori, you can't stop me this time! I can't let Zeus hurt you!!" "No, Seiya! Please look carefully!!" "Uhm!! ", groans Seiya! As he studies carefully the God that is sitting on his white throne, he finally realizes it is not Zeus sitting on the throne! IT IS HIS KAMUI!! CAN COVER THE WHOLE UNIVERSE!!" Suddenly, the Kamui of Zeus shines!! Seiya feels immense fear because he knows, if it was any other mortal here who didn't awake the Nine Sense, that mortal would instantly be killed by that massive light! Finally, a man is wearing the Kamui!! The man's face can be seen and Seiya is in awe. Zeus's hair is white as the clouds, his eyes are blue but are deep, as deep as the cosmos!! His face is filled with such Beauty, such Sacredness, and such Nobility!! "THIS MAN!! ", shouts Seiya, "THIS MAN IS THE KING OF THE GODS!! THE GREAT GOD ZEUS!?" Seiya has never felt such Cosmo and Dignity in this scale in anyone before, not even Athena! These words wakes Seiya, "SHUT UP!! LIKE I SAID BEFORE, I DON'T CARE IF YOU'RE THE ALMIGHTY GOD ZEUS!!" A million of punches of light are heading for Zeus but suddenly, all of it gets bounced back!! "Seiya...! ", groans Athena deeply worried about the Pegasus Saint. Seiya feels deep pain. He is lying on the floor, unable to move. He wonders if it was Zeus's powerful Cosmo that reflected the attack, but then, he looks up!! "WHAT IS THIS!? ", shouts Seiya, seeing an invisible barrier in front of him barring him from Zeus and Athena! "Like I said, your struggle is futile..."
At that very moment, Zeus starts to concentrate his Cosmo in his Scepter and he shouts, "DIE!! BOY!!!!!!!!!!!!!!" THE FINAL END OF ZEUS CHAPTER! !